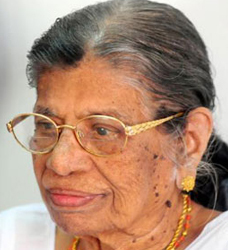 K.R.Gowri - Popularly known as Gowri Amma, a prominent figure in the Communist Movement in Kerala, has played a profound and significant role in determining the destiny of the state. A relentless and staunch crusader for the downtrodden, she has proved herself as an efficient administrator while remaining a perceptive politician. K.R.Gowri was born at Pattanakad, in Alappuzha district as the seventh daughter of K.A.Raman and Parvathi. After her schooling at Thiroor and Cherthala, she graduated from Maharajas College, Ernakulam. She then obtained her law degree from Law College, Ernakulam. Starting her public life through trade union and peasant movements, K.R. Gowri Amma was elected to the Travancore Council Of Legislative assembly in the Year 1953 and 1954 with an overwhelming majority. In 1957, when the first elected Communist Government took office under the Chief Ministership of E.M.S. Namboodiripad, V.S. Achuthananthan was overtaken by the Communist couple from Alapuzha - T.V. Thomas and K.R. Gowri Amma, who went on to become influential Ministers. She became Revenue minister in the first EMS Ministry in 1957 holding the portfolio of Revenue Minister. As revenue minister in the first communist ministry, she piloted the first land reforms bill. Her marriage to fellow minister and CPI strongman T. V. Thomas is part of communist folklore in Kerala. She got married to him in 1957 but they separated when the Communist Party of India split into two, with Gowri joining the newly formed Communist Party of India-Marxist in 1964. In 1967, both Gowriamma and Thomas became ministers in the Namboodiripad government and both of them lived in two nearby ministerial bungalows. The CPI-M though dumped her later on, even though she was a prominent woman leader in 1987, after projecting her initially as a chief ministerial candidate. On that occasion, E.K. Nayanar became CM, due to the machinations of the Malabar lobby. In 1994, K.R. Gowri was expelled from CPI (M) on charges of anti-party activities, even though she was considered as one of the icons in the party. Following which, she established a new political outfit named Janadipathya Samrakshana Samithi (JSS) and joined the Congress-led United Democratic Front, which for years she opposed when she was in the CPI-M. She was made a minister in the A.K. Antony cabinet in May 2001. She became a minister again when Oommen Chandy took over from Antony as chief minister. Gowri Amma has the unique distinction of sitting in the Kerala assembly for a record 16,345 days, edging out former minister Baby John in terms of number of days and late former minister P.R. Kurup in terms of age. Gowri Amma also holds the record of winning all but one of 12 assembly elections in Kerala. The only defeat came in the 1977 polls. She has been minister six times.